victorian | Oh, The Glamourous Life! 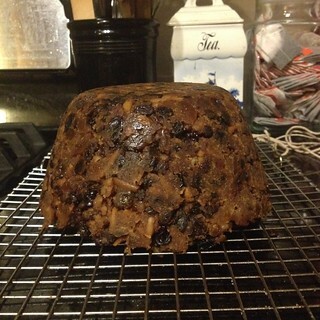 Earlier in the year I showed you how to make and steam a Christmas pudding. Now that your pudding is good and aged, it’s almost time to serve it! 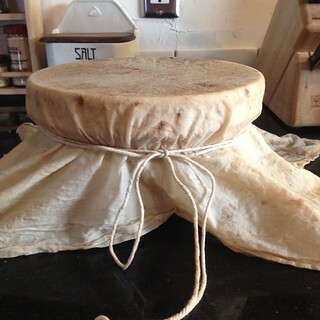 Take your finely-aged pudding out of its aging container and unwrap it from the cloth. Get your pudding basin and butter it well, then slip your naked pudding into it. Wet the pudding cloth, wring it out, and tie over the top of the basin with your pudding string just like you did before. Steam the pudding for an hour or two until it’s heated through. You really can’t overcook it; just make sure the water never boils away. Traditionally Christmas pudding is served with hard sauce. It’s not called “hard” because it has booze in it (although it does), but because it can’t be poured. You’ll have to scoop it onto your warm slice of pudding where it will melt into a puddle of deliciousness. Superfine sugar, also called bar sugar and caster sugar (in the UK), can be a little hard to find. If you can’t scare up any, use confectioner’s sugar (I don’t care for it because it’s got cornstarch added) or grind up granulated sugar in the food processor. Straight granulated sugar will make your hard sauce gritty. For the booze, use whatever you’ve been aging your pudding with. In my case, that’s rum. Usually dark rum, but my pudding drank it all. 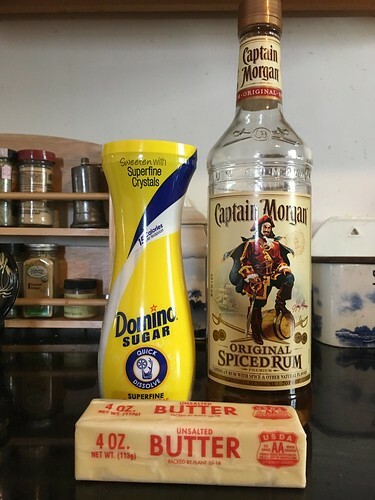 Cream together the butter and sugar, then beat in the booze. It’s that easy! Keep the hard sauce in the fridge until you’re ready to serve. Now to serve the pudding aflame! Place the pudding on a serving platter, preferable one with a bit of a lip. Gently warm 1/2 cup of booze in a sauce pan. Turn out the lights in the dining room and place the pudding platter on the table. Get your camera ready. Pour the warm booze over the pudding and light the vapors with a long match. Voila! When the flames go out, slice and serve with a generous spoonful of hard sauce. Here’s last year’s pudding and the proud cook. If you make Christmas pudding, I want to hear about it! 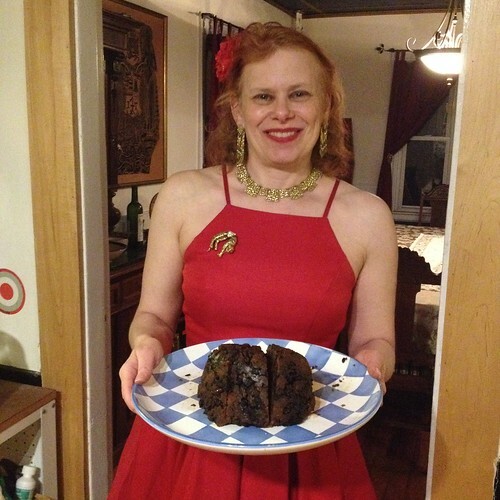 Last week I showed you how to make a fruity, boozy Christmas pudding. Today we’re going to talk about how to steam it and store it. To steam the pudding, you’ll need a pudding basin, a pudding cloth, and a pudding string. Fortunately, none of these are too difficult to acquire. You’ll also need a big pot, large enough to hold the basin. A pudding basin looks like a bowl. 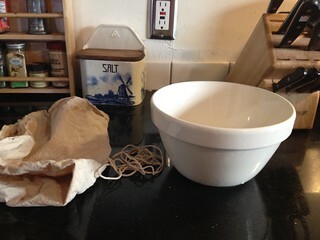 In fact, you can use a mixing bowl. The important parts are that it’s heat-proof (mine are ceramic) and it has a lip where you can tie the pudding string and it won’t slip. For this recipe you want a 6-cup basin. There are also metal pudding molds, which can make for a more decoratively-shaped pudding. The pudding cloth is a big piece of plain, undyed cotton fabric, well-washed. Mine is a square of unbleached muslin. Flour sack towels also work well. Lastly, the pudding string is just some sturdy cotton kitchen string. Grease the inside of your basin well, then spoon the pudding batter into it. The pudding should be below the rim of the basin. Wet your cloth with hot water and wring it out. Some say to also flour the wet cloth to keep the pudding from sticking to it, but I’ve found it just makes a mess. Place the cloth on top of the basin and tie the string just under the lip to hold the cloth in place. I used a slipped reef knot to make a secure knot that can be untied easily when it’s wet (which it will be). Now take opposite corners of your cloth and tie them together over the top of the basin. Repeat with the other two corners. You now have a handle. Now it’s time to steam! You’re going to place the pudding in a pot of boiling water, with the water coming at least half way up the basin, but no more than an inch or two from the top. It’s tricky maneuvering a heavy pudding into boiling water, so I’ve found the best solution is to use a pot with a pasta insert. I fill the pot with the insert in place, check the water level by putting in the basin, then take the insert and basin out, and start boiling the water. 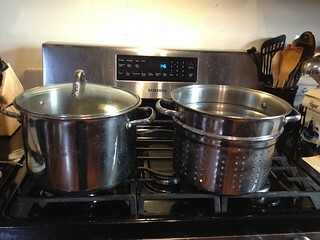 Once it’s boiling I gently lower the insert with basin into the pot. If you don’t have this kind of pot, use the cloth handles to carefully and gently lower the pudding into the boiling water. Cover, lower the heat, and let the water gently boil for at least 2 hours (more won’t hurt — I’ve seen recipes call for five hours of steaming). You’ll need to replenish the water from time to time as it boils away, so keep a teakettle handy. Make sure the water you add is boiling and that you don’t pour it onto the pudding itself. After a couple of hours, take the pudding out. Either just remove the insert or use the cloth handles. Be very careful! Everything is going to be steaming hot and wet. Take off the string and cloth and test the pudding for doneness with a long skewer. The skewer should come out clean. Let the pudding cool a bit in the basin, then turn it out onto a rack. Let the pudding cool completely. Now we age it. You’ll need your pudding cloth again, and your alcohol of choice, and a container in which to age the pudding. I use a food-grade plastic bucket with a lid that I got it from my local ice cream shop — I think it used to hold marshmallow topping. 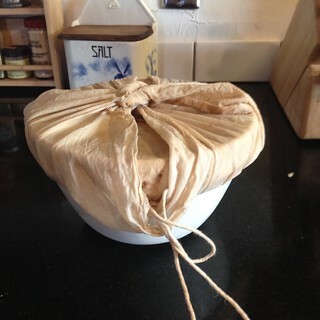 Wrap the pudding in the cloth and put it in the container. Pour 1/4 cup booze over the pudding. Cover your container. It doesn’t have to be an air-tight seal — in fact, it shouldn’t be. Put it someplace cool and dry until Christmas. I keep mine in a cabinet in my unheated pantry. If you don’t have a pantry or a cellar or similar, you could keep it in the fridge. Once a week, flip the pudding and feed it another bit of booze. I know some people who use a pastry brush to gently coat it with alcohol. I’m lazy and just pour a splash of rum on top and let in run down the sides. You don’t even need to take the cloth off. Puddings should age for a minimum of a month. I’ve aged them for as long as a year and a half. As long as you keep them somewhere cool and keep feeding them alcohol, they’re going to be fine. Once we get closer to December, I’ll tell you how to prepare your delicious pudding for serving, how to make sauce, and most importantly, how to flame it! You may have seen the title of this missive and thought “Mina, Christmas pudding? Christmas is like a year away. Can’t you read a calendar?” Fear not, O Reader, for this pudding wants to be made well in advance and aged like a fine wine or cheese. The longer it sits, the better it tastes. The last pudding I served had been aging for about 16 months and was just amazing. Now, one does not *have* to age a Christmas pudding — there are Victorian recipes for puddings to be made and eaten right away — nor does one even have to use alcohol for an unaged pudding (the temperance movement, you know), but those are not the kind of pudding we’re going to make. This pudding is going to be steamed and will require some specialized equipment, which I shall discuss in another missive. Flour, bread crumbs, brown sugar, salt, cinnamon, ginger, nutmeg, clove, mace, various dried fruits, nuts, lemon, eggs, suet, and booze. The most important ingredient is suet. Suet is a white fat from around beef kidneys and has a very neutral flavor. Any other beef fat (aka tallow) can have a kinda meatish taste. I’m told there is vegetarian suet out there and some people have used vegetable shortening in steamed puddings, but I don’t know how well it ages. The suet should be grated. I find it’s easiest to freeze it and then grate it with a food processor. If you’re grating by hand, keep it cold, so it stays firm. If it starts to get mushy, put it back in the fridge for a bit. 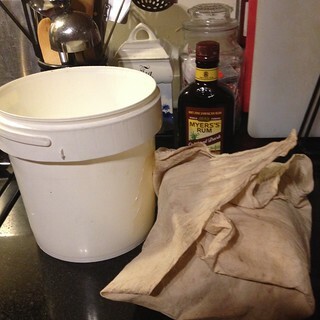 Once I’ve grated a batch of suet, I split it into 4-ounce portions and freeze them until I need them for pudding. Equally important is the booze. I use rum, but you could also use brandy or bourbon, really whatever brown liquor you prefer. You need this for the aging process. Also for the flaming, but that’s quite a ways away. Combine the flour, bread crumbs, sugar, salt, and spices in a big bowl. I make my own bread crumbs, but you could use purchased plain crumbs. Add the fruit and nuts. I use a mix of raisins, golden raisins, currants, dried cranberries, dried sour cherries (from my tree), and candied citron. Sometimes I add candied orange peel, but I didn’t make any this Christmas, so I didn’t have any to hand. You could pretty much add any dried fruit you liked, as long as it was cut into little bits, about raisin-sized. You’ll want 5-ish cups of fruit. For the nuts, I use slivered almonds, but you could substitute your favorite nut, chopped into bits. Toast the nuts for better flavor. Peel the lemon and chop the zest finely. Add to the batter. Hang on to the rest of the lemon. Toss the fruit around in the dry ingredients until they’re coated. This will keep the fruit from clumping up and sticking together. Add the suet and mix it in. Lightly beat the eggs and mix them in. Juice the lemon and add the juice and then the rum. At this point it’s going to be easiest to mix with your hands. Your pudding batter is ready to be molded and steamed! Steaming is a bit of a process and deserves its own missive. I’ll cover that next week. 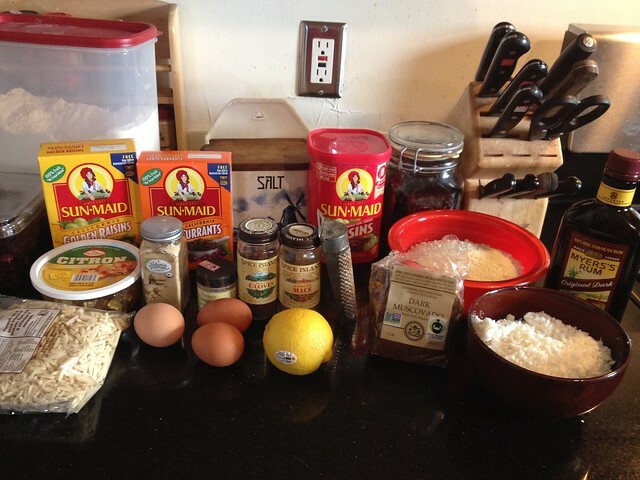 Here’s the recipe I use. It’s not based on a specific historic recipe, although I was inspired by Kathleen Curtin‘s workshop at Plimoth Plantation and the book Lobscouse and Spotted Dog. Combine the flour, bread crumbs, sugar, salt, and spices in a big bowl. Add the fruit, nuts, and lemon peel. Toss the fruit with the dry ingredients so they’re coated. This will keep the fruit from clumping up and sticking together. Add the suet and mix it in. Mix in the lightly beaten eggs. Add the lemon juice and then the rum. Mix with your hands. It’s starting to cool off a bit, but we had some terribly muggy days this summer. I recommend this delightful Victorian ice recipe to counteract such misery. It’s made with (no surprise from the name) water rather than a cream base. I think it’s more refreshing than ice cream on a really hot & humid day. 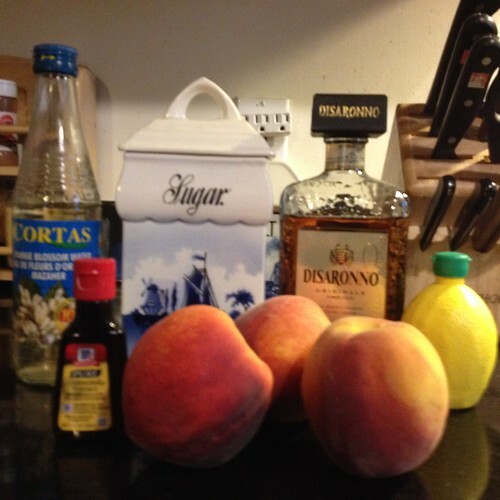 Peel 6 good peaches, and crack the stones, and remove the kernels, which must be pounded; put in a stewpan with 1 pint of water, 4 ounces of sugar, and juice of 1 lemon, cook the fruit for 15 minutes, then tammy, and add a wineglassful of noyeau and 1 glass of orange flower water, a little carmine. Freeze. I assumed that Victorian peaches were smaller than modern ones and halved the amount. This turned out to make the right amount for my ice cream freezer, so hurrah for me. It was a bit of a challenge to acquire peaches in the first place as the crop in the northeast this year suffered badly from our weird winter and the farmers’ markets have been lacking. The ground peach kernels are used to give the ice an almond flavor. Rather than playing games with cyanide (this small an amount is probably safe, but still…), I used a splash of almond extract instead. I know the picture shows a fake plastic lemon, but that’s because I took it after the fact and I had used my stock of fresh lemons. Someday I’ll remember to take the ingredient picture first. A tammy is a fine hair sieve that you would rub the cooked peaches through. Because I don’t have servants, I used an immersion blender and resigned myself to a less than perfectly silky smooth puree. My research showed that a Victorian wineglass measure was about 2 fluid ounces. Noyeau is a almond-flavored liqueur; I used amaretto. Orange flower water, like its cousin rose water, is very potent. I recommend using very little. Carmine is a red food coloring made from cochineal, an insect. I actually have some cochineal in its raw form, but that seemed excessively authentic. I considered adding a little red food coloring, but I was out (blue and green coloring, yes, but no red or yellow. Why?). 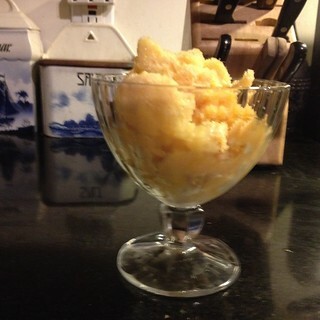 Besides, the puree had a lovely peachy color in its natural state. If you don’t have an ice cream freezer, there are ways to fake one. Or you can treat this like a granita and freeze for a couple of hours in a shallow pan, stirring every half hour to break up the ice crystals. To peel the peaches, dunk them into boiling water for a few seconds and then into ice water. The skins will come right off. Halve the peaches and take out the pits. Cook the peaches with the water, sugar, and lemon juice for 15 minutes. Remove from the heat and puree. Add almond extract, amaretto, and orange flower water. Let cool completely. Pour into ice cream freezer and follow the instructions.